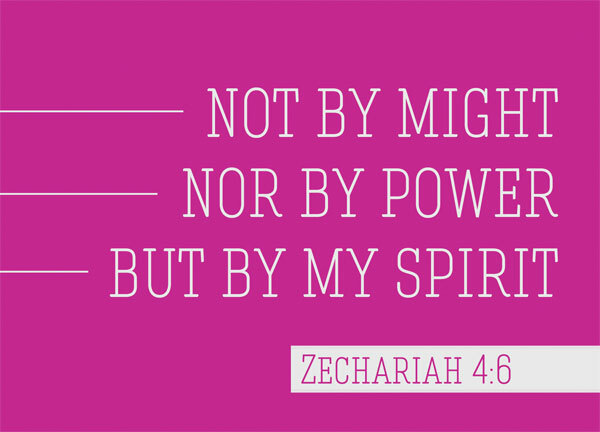 he said to me, “This is the word of the Lord to Zerubbabel: ‘Not by might nor by power, but by my Spirit,’ says the Lord Almighty. The book of Zechariah is the eleventh out of the 12 Minor Prophets, and by far the longest out of them, detailing the prophecies and ministry of the prophet Zechariah. It is not an easy read – filled to the brim with apocalyptic literature and Messianic prophecies. It’s a personal opinion of mine that prophetic verses are the hardest to understand. Zechariah emerged as a prophet and prophesied to the Jews in Judah and Jerusalem along with Haggai many years after the fall of Jerusalem [Ezra 5:1] – the Babylonians have been taken over by the Persians, and Darius was in power [Zech 1:1]. He spoke a lot about the historical context of the Israelites, and how their fathers have turned away from the Lord and earned the wrath of God, which accumulated and manifested in the fall of Jerusalem. The Persians were not as oppressive as the Babylonians, and Darius even decreed to allow the rebuilding of the temple [Ezra 6], which coincided with Zechariah‘s preaching to return to God [Zechariah 1:3] and was led by Zerubbabel. In today’s study we will look into the role of Zerubbabel and how important it is that it is by the Spirit and not by his own power or the might of his people that he achieved all that he did. This is the word of the Lord to Zerubbabel – Who was Zerubbabel? He was the governor of Judah, and likely a close acquaintance of the high priest Joshua [Haggai 1:1]. He was so highly esteemed that he was described to become like the Lord’s signet ring was chosen [Haggai 2:23] by the Lord and tasked to rebuild the temple [Zech 4:9], and this entire event was often regarded as one of the many types of Christ – a foreshadow of Christ as the Builder. How so? Zerubbabel was a servant of the Lord, governor of Judah, tasked to bring the Jews out of captivity, chosen to rebuild the temple. Likewise, though perhaps on a far greater scale, Christ is God’s righteous servant, governor of the Church, redeemed and delivered the people from the shackles of sin through his ministry and his crucifixion. Most importantly, he was the builder of his Church – he laid the foundations, and watched and maintained it. Zerubbabel may be a small-name character in the Bible, but through him we can get to understand Christ better. Not by might nor by power – building the temple is a huge project. It was a project the demands a huge amount of manpower, time, effort and resources. It was an ambitious project, the kind of project that you’d be laughed at for even attempting. But what did God tell Zerubbabel? The success of this project depended not on might nor by power. Not by whose might nor by whose power? I would like to think that the lack of the word ‘my’ in this phrase makes it clear that God wasn’t saying – not by my might nor by my power; instead God was saying, not by your might nor by your power; not by men’s might nor by men’s power. It didn’t matter even if you had all the manpower you needed, all the resources you needed. It didn’t matter even if you didn’t have enough manpower and resources. Because the success of this project depended not on those things, the fulfillment of a promise of God depended not on worldly materials, but on the Spirit of God. but by my Spirit – The fulfillment of God’s promise depended not on whether Zerubabbel and co were qualified or skilled enough or not; it did not depend on whether they had enough materials or not, it did not depend on whether they had enough people and collective strength or not. Instead, all it depended on was whether God is with them or not. All it depended on was his Spirit. For when God is with us, the Spirit sanctifies and strengthens us that we can perform what God has tasked us to, in faith. Perhaps we are placing our focus on the wrong things. We recruit more manpower, we raise more funds, we do this, we do that – all to ensure that our task can be held out smoothly. It’s a bit like Martha, who was distracted by all the preparations that had to be made [Luke 10:40]. We often forget that few things are needed—or indeed only one [Luke 10:42]. That one thing is God. The presence of the Spirit. Being with God. Listening to Jesus. Indeed, often we struggle to be up to task, but when hiccups occur we see the grace of God. It is through our flaws and our inadequacies that we see witness the greatness of God. Let us not lose sight of God. Not by man’s power, nor by the might of kings – but by the Spirit of the Lord. Tried to comment but would not load. In Africa so things are different here online. Good blog post really liked your section in the conclusion. We never have enough of what the west thinks you need for ministry. But He is always sufficient. ^^ indeed, he is always sufficient. I live in Asia, so probably not the West either – and probably with vastly different needs for ministry too, yet God’s grace is the same, it is equally sufficient. wonderful post, yes especially the last paragraph. i got your letter and wonder if you have decided what to do, will you go to work for your prof? i´m writing soon! No… The real offer wasn’t as good as he wanted it to be. There are still possibilities with some of his contacts, and he said he likes to dream – but I’m not getting my hopes up. I’m still pausing, pondering, praying.